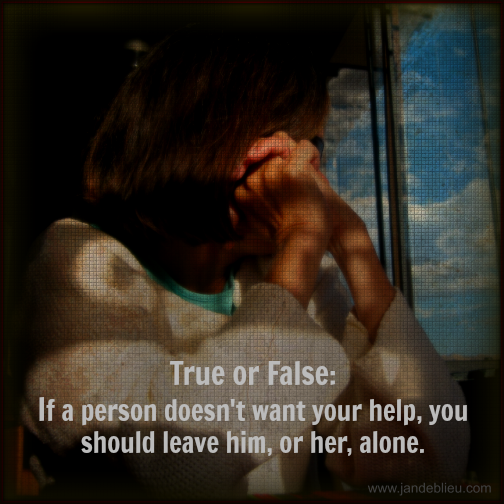 "I Don't Need Your Help" -- But What if He Really Does? "As a child raised in an alcoholic home," Grace's message began, "I never learned the correct response to certain situations. 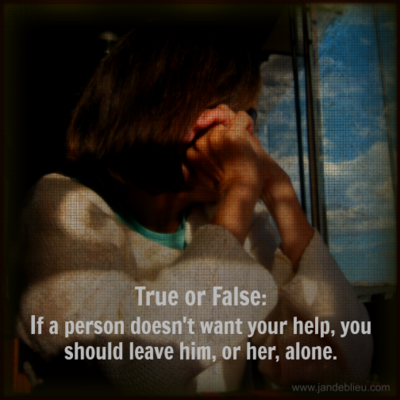 I would not ask for help, and if offered help would often decline, afraid of the person's motives." Not long ago I posted the question above on my Facebook page to see what kind of responses it would elicit from readers. In the years I've spent trying to learn how to serve those in need selflessly and effectively, the phrase "Don't force yourself on others" has become almost a mantra. But then I received that private message from a friend I'll call Grace, the child of alcoholic parents. Starved for support but too nervous to ask for it, Grace joined a church, where she basked briefly in the love and attention of fellow worshippers. But the help they offered her came with a price. When she revealed that she didn't share their beliefs, they turned their backs on her. "The help, support, and even friendships ended," she wrote. With substance abusers, her message continued, an offer of help "can be a matter of life or death," even as it's shunned. Depressed people, too, may vehemently refuse help, even when they're in danger of taking their lives. Someone who is suicidal may believe he doesn't deserve to be helped. He deserves oblivion. As for the rest of us--we live in a society where it's often considered a little shameful to ask for help. We're expected to stand on our own two feet whenever we're able. Many people, myself included, are reluctant to appear weak or needy. Far too often we go it alone and run straight into trouble. There are times, too, when "helping" someone devolves into hovering. Recently I asked an ill friend what I could do for her. "I know one thing I don't want, and that's people monitoring my every move," she said. "I want--" she laughed, "I want loving support when I want it." The only way I know to even approach this is simply to make myself available, without being pushy. Simple, right? Not at all. So how can we know when to step in and when to stay out? The answer will differ in each situation. To discern the best course of action means cultivating a quiet alertness, so that you can clearly see and perhaps even anticipate what the person needs. This deep brand of caring comes instinctively, but only from a quiet, patient mind and an open heart. Grace had additional wisdom to offer: "At the very least, yes, offer help," she wrote. "If declined once, offer again. If declined altogether, your smile or kind words may plant a seed of hope that they will later seek out." Another reader wrote, "I don't want or seek help. I need and welcome presence." To that I offer a hardy Amen. May I always remember that one of the greatest gifts I can give others is not the help I think they need, but a kind, listening presence. Together we can take it, or not, from there.